Aloo sheddho means steamed potatoes, and it’s garnished with mustard oil and green chilies. It’s not a ceremonial dish, but it’s hearty, filling and easy to make. It can also accompany daal to eat with rice. 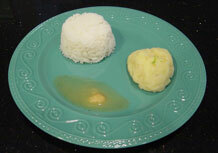 Aloo sheddho bhat is a classic Bengali preparation. 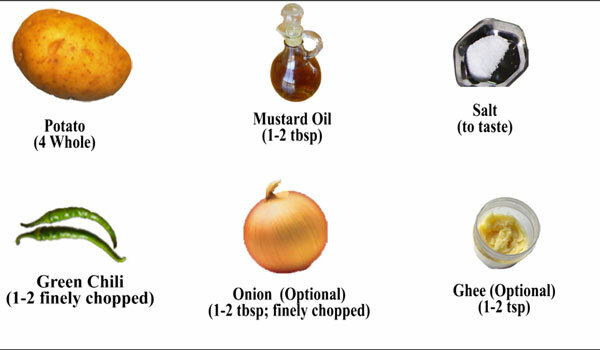 1) Boil the potatoes in any way you like, either in a regular stove, pressure cooker or a microwave. Some people put it directly in the rice while it is being cooked. We used a microwave. 2) Put the potatoes in a wide container with a lid, add water to cover about three fourths of the potatoes, add some salt, cover, and microwave for 10 minutes. Check to see if they’re soft, as different microwaves have different power levels. 3) Leave them in the microwave until they cool. 4) Meanwhile, finely chop the green chilies and shallots. 5) Pour cold water onto the potatoes to cool them, skin and mash them with a fork, spoon or a potato masher. 6) Add mustard oil, chopped green chilies, shallots, salt and ghee and mash it all together.